Unique illusory artwork from British artist Alex Chinneck has been unveiled this week in Tinsley, Sheffield, originally commissioned by Vauxhall Motors. First installed on London’s Southbank in 2015, ‘Pick Yourself Up and Pull Yourself Together’ sees the artist suspend a Vauxhall Corsa, 15 feet in the air. The gravity defying feat can be found on Sheffield Road, Tinsley, just a short walk alongside the canal until 17th September 2017. 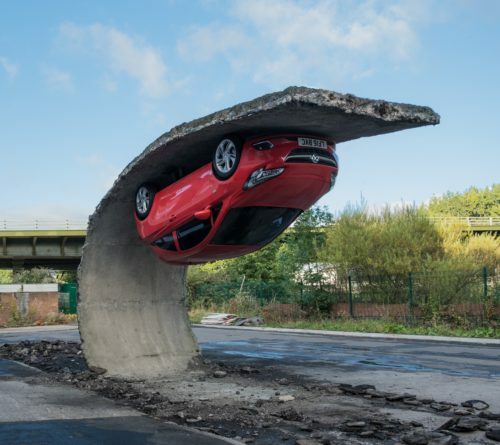 The installation turns a parking space on its head, peeling back 15 metres of arching tarmac to turn a one tonne car upside-down as the vehicle grips the curling road with no visible support. Alex Chinneck has been commissioned to create a new permanent artwork in Tinsley, at the site of the Tinsley Cooling Towers. The Vauxhall Corsa installation is a teaser of what is to come, with the public unveiling of the Tinsley Art Project showcasing Alex’s new artwork at Sheffield Town Hall on 21st September at 7.30pm. The installation of Pick Yourself Up and Pull Yourself Together in Tinsley aims to demonstrate the potential of public art and engage the local community and visitors, plus to promote awareness of the Tinsley Art Project, the biggest public art commission to date for Sheffield. “With an effortlessly curling road I hoped to transcend the material nature of tarmac and stone, giving these typically inflexible materials an apparent fluidity. Vauxhall Motors allowed me a great amount of creative freedom and this collaboration offered my studio an exciting platform to explore new areas of engineering and fabrication”. Commenting on the commission, Kate Oyler, Brand Communications Manager at Vauxhall Motors added: “It was fabulous to work with Alex on this unique project, so we’re delighted to see it pop up again and bring pleasure to a brand new crowd”.